Bold and brash, Bar Crusher has not only stormed the aluminium fishing boat market over the past 10 years, it’s now a market leader with an outstanding product to match. It has a strong following among the fishing fraternity and it makes some pretty bold claims in its catalogues, but all that means nothing when you enter the AGB arena. This is where things get serious and advertising hype gives way to reality. Bar Crusher has form, having qualified for all AGB finals, and in fact it won the inaugural AGB competition back in 2010. We were keen to see if this year’s contender was the real deal or just a pretender. The Bar Crusher 670 Hard Top stepped up and impressed from the moment we slammed down the throttle. Our judges were unanimous in their praise for this boat. 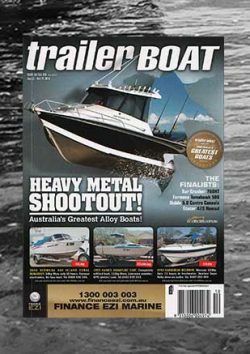 In fact the Bar Crusher 670HT was the only boat on test at Australia’s Greatest Boats 2012 to achieve a perfect 10 from all judges for its fishing suitability. We guess that’s why Bar Crusher has trademarked the term “Fishing Weapon”. It’s 100 per cent right on the money. The 670HT has a truly menacing look; its sharp lines and blackened windows sit under that big hard top, the latter providing a solid structure and great protection when things get messy in a big sea. Power comes from a fuel-injected, four-stroke Suzuki DF175. It’s well suited to this boat and the partnership produces a great ride with heaps of urgency. From rest the Suzuki powers the 670HT to the plane in just three seconds, topping out at over 40kts (74kmh) not long after. Bar Crusher is also an innovator, constantly pushing the limits of alloy boat design. Its outstanding Quickflow water ballast system provides excellent stability at rest and is a trademark of Bar Crusher’s design. New for this year is the automated Bar Flap option. It’s designed to keep the ballast tanks full when on the move and it works a treat. The plate aluminium design features a 2.35m beam and a 20-degree deadrise. At 6.7m long it’s a reasonably big boat and the deck area is wide, open and easy to work in. It’s got a clear, open cabin complemented by that great hard top and the seats are supportive, providing good comfort for many hours at sea. The helm layout is also a model of functionality — the wide dash shelf should be standard on every boat. The 670HT is fast and stable; it’s a well-conceived sport fishing rig. At over $90,000 as tested it certainly isn’t cheap — but nothing’s missing, either. It stamped its authority on AGB 2012 and was a resounding winner. I’ve just gone for a test flight on the Bar Crusher 670 Hard Top. Not only does it tick all the boxes, it actually creates some new ones I wasn’t even aware of! It looks like the design child of a house brick and an attack helicopter… but really, it performs like a Porsche. You hardly knew you were in an aluminium boat. Stability was excellent. Ran the new automated ballast flap… worked a treat. Would I own one of these? Absolutely, in a heartbeat! After a test drive, there aren’t too many that compare. I really like Bar Crusher and the way these boats go through chop. You can just flatten them (the throttle) and they get up through the water and really go across the water really smoothly. But you can throw them into a turn and they go exactly where you want them to. The water ballast system keeps the boat really stable. It’s got the big Suzuki 175 on the back, which pushes it along nicely at around 40kts. When you drive it, you drive it hard, fast, deep and long. A “classic” plate boat. Soft on the water, it can handle high speed. It’s beautiful to drive. The finishes seem pretty good. The hardtop is an absolute plus. Some people think the ballast system is a bit of a gimmick, but I think they are classic. Soon as you become stationary, about 300kg of water/weight goes into the hull. It’s an absolute winner of a boat as far as ride is concerned. Wowee! The Bar Crusher 670HT — I don’t know where to go from here. This day is just getting better and better. That is a boat that will put a horn on a jellyfish! The Suzuki 175 on the back… perfectly propped, it just throws you off your feet. To drive it is to love it. It’s a boat you would take further offshore, just so you got a better ride home. I just couldn’t stop smiling. But it doesn’t stop there — it’s outfitted with everything I’d want to go fishing. For me, it’s the pick of the fishing boats. Good corrosion protection, nice paint finish — all the fruit and power to boot. Bar Crusher — what a competition! I gotta tell you, I did all the stuff for which Bar Crushers are famed. I punched it through waves and jumped off swells. It did it all just so well. For its size it’s incredibly capable and agile — it handles like a skateboard! When you look at the video, I’m sure you’re going to see a great big bear smile behind the wheel.